Lily James struck a pose yesterday evening(July 16th) on the blue carper for the London premiere of Mamma Mia! Here We Go Again at the Eventim Hammersmith Apollo. 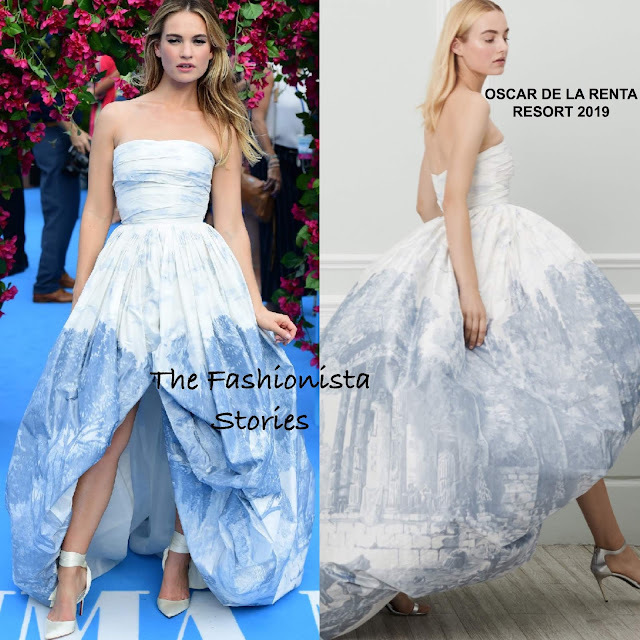 The way Lily was posing, you can tell that she was feeling her OSCAR DE LA RENTA RESORT 2019 strapless bubble, high-low hem gown. The gown was partially lined, with a corset bodice and train in the back. While I really like this gown on Lily, I have to say that I miss the fullness of the skirt like featured on the model. Maybe it works better in motion. Beauty wise, she went with center light wavy tresses and a pink lip color which topped off her look along with CHRISTIAN LOUBOUTIN tie-around pumps. What do you think of Lily's look?